(1975) Roscoe’s Chicken & Waffles, Hollywood | Remains of L.A. There is a rope across the door, and a guy with a clipboard. We told him how many of us there were and waited a little while. There was a party of fifteen waiting in front of us, but even so it didn’t take long before we were let inside. -Walls of dark, diagonal wood panels, yellow tile floor with a checker pattern on the steps, light wood tables and chairs, mirrors on some walls making the space seem bigger. The front room is two levels, with a curved low wall and wide steps. The curved wall is a booth on the lower level. 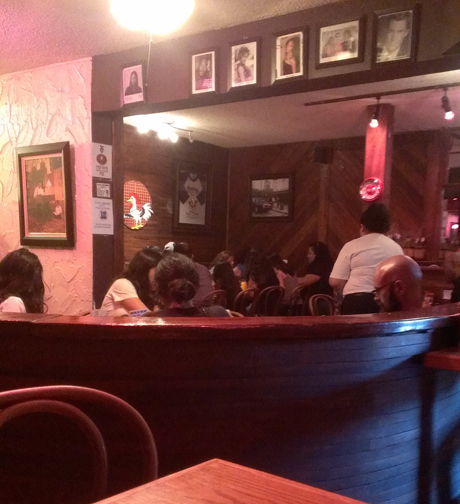 There’s a room in the back, much bigger and brighter, with rows of tables and a fantastic mural on the wall. The front room, where we sit, is cozier and dimmer. There is a row of celebrity photos near the ceiling, and framed pictures. One painting I love is of an old-timey man wearing suspenders, sitting at a desk in his book-lined den, while his son sits on the floor next to the desk reading a book. One one wall is a picture of the logo in tile, and western-saloon type doors lead to the bathrooms. -I got a chicken leg and a chicken thigh, and a biscuit, and rice and gravy. I didn’t get waffles because I can’t eat sugar, but Terry did and I had a bite of his. It was wonderful, as was the chicken–probably the best I’ve had since Dinahs’. The biscuit was great too, but the rice and gravy seemed a tad bland. David (my husband) got the special, which was two pieces of chicken and a biscuit and rice and gravy for six dollars. -David (my husband) and Terry got coffee, and exclaimed enough over how fantastic it was that I risked the caffeine and had a sip of David (my husband’s) and it was incredible. 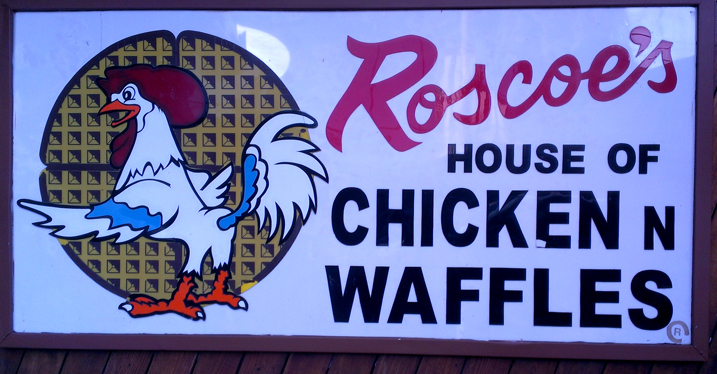 -Some people think maybe the chicken on the logo is named Roscoe, but I’m pretty sure the chicken belongs to Roscoe. -A waiter took our order and then a moment later a waitress came and tried to take our order and the waiter suddenly appeared at her side and pretended to be offended and angry and they acted like maybe there was going to be a fight and it was extremely charming. -The place was fairly crowded and the voices around us were sort of a hum but then a woman at the next table said loudly, “Always enjoy your food. ALWAYS.” I think she’s right. -On either side of the door were matching glitter banners that said “God Bless America.” Those were probably because it was just recently the fourth of July, is what I’m assuming. -I got anxious, as I always do, when I got near the end of my water glass and couldn’t see the waiter to get more right away, but Terry gave me his water so it was okay. I probably don’t need to be as silly as I am about always having enough water. -Three young girls sat at a table near ours. They were about thirteen and I’m fairly positive they were at a restaurant without parents for the very first time. They were working incredibly hard at being nonchalant. -In the ladies’ room, a little girl was standing by the sink, having just washed her hands, looking very anxious. I almost walked by but realized in time that she couldn’t reach the paper towel dispenser, which was quite high on the wall, so I got her some paper towels. -There was a sign on the wall that said “try our sweet potato pie” and I campaigned hard to get David (my husband) or Terry to order a piece so I could have a bite but then they were all out. I think they should take down the sign when that happens. -After we ate, the waiter brought us handy naps. I absolutely love that; even though I understand that it’s just policy it always feels like they’re psychic. Who I Ate With/Things We Talked About: The movies “Tapeheads” and “The Big Picture,” a college class in Terry is taking on ethics and foreign relations, Rudyard Kipling, the time David (my husband) was at a Roscoe’s and a lot of people in the place seemed very upset, and he asked the waitress what was up and found out Whitney Houston had died. What Sort of Ghost I’d Expect to Find if I Believed in Ghosts Which I do Not: Three best friends who started coming here after school the year it opened, and eventually brought dates here, then their wives, and then, finally, their own children.